First drive: Citroen C2 VTS diesel | What Car? Can you be environmentally conscious and still drive a hot hatch? Citron would certainly like you to believe you can, so you flock to its showrooms in a rush to buy the face-lifted C2 VTS diesel. The reality is a bit different. Sure, the green credentials are good, and may lure in cash-strapped youngsters. Low emissions drop the car into the 35-a-year tax band, while average economy of 64.2mpg should mean you and the petrol station staff remain strangers. 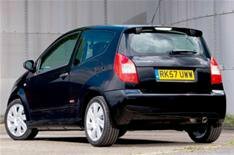 Trouble is, despite its 107bhp motor and beefy styling, theres little about the C2s performance thats sporty. Its slow off the mark, and is slightly pacier only once it gets going. Lets face it, 0-62mph in 9.4secs isnt going to wow anyone. Nor is the steering, which gives very little feedback. The ride is also too stiff around town, and too fidgety if you push on down a bumpy country road. Worse still, despite its unenthusiastic performance, the engine is gruff, and road and wind noise chip in at higher speeds. That, plus the hard plastic finish to the interior, makes the cabin a pretty uninviting place to be. However, the face-lift has brought with it lots of equipment, including aluminium pedals and an aluminium-effect gearknob, electric door mirrors, sports seats, front foglights, air-con, stability control and an alarm. Then again, so it should for 13,895. Theres also a revised grille and bumpers. This being a Citron, that price is open to negotiation, but even at the Target Price its a lot of money for a car that cant transport your rear-seat passengers in reasonable comfort, and that doesnt deliver nearly enough thrills.